Our adjustable chrome moly tubular rear upper lateral control arms (rear position) for the Chrysler 300C and Dodge Charger, Challenger and Magnum will allow adjustment of and lock in your camber settings, minimize wheel hop and increase traction! Our adjustable chrome moly tubular rear upper lateral control arms (rear position) are much stronger and lighter than the factory’s cast arms. They’re constructed from TIG welded 1.00″ x .095″ wall 4130N chrome moly tubing providing for maximum strength and durability. Our chrome moly tubular rear upper lateral control arms (rear position) for the Chrysler 300C and Dodge Charger, Challenger and Magnum will lock in your camber settings, minimize wheel hop and increase traction! Our chrome moly tubular rear upper lateral control arms (rear position) are much stronger and lighter than the factory’s cast arms. They’re constructed from TIG welded 1.00″ x .095″ wall 4130N chrome moly tubing providing for maximum strength and durability. 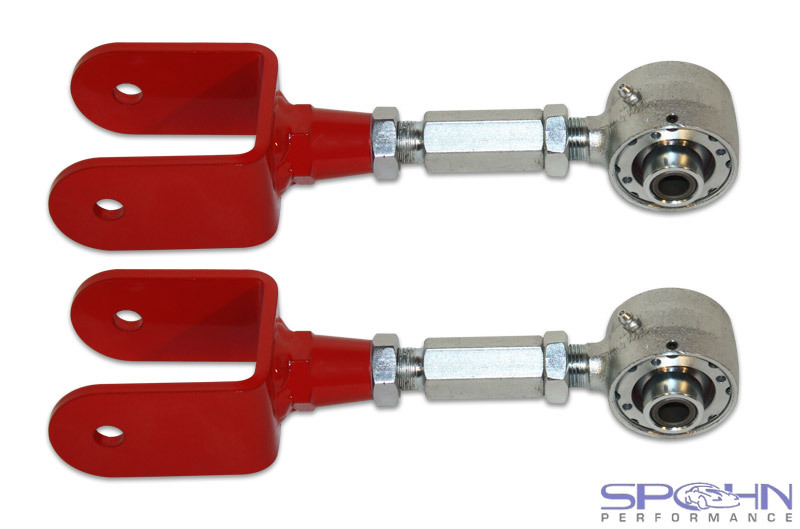 Our adjustable chrome moly tubular rear trailing arms (track bars) for the Chrysler 300C and Dodge Charger, Challenger and Magnum will fine tune and lock in your caster settings, minimize wheel hop and increase traction! Our adjustable chrome moly tubular rear trailing arms (track bars) are much stronger and lighter than the factory’s cast arms. They’re constructed from TIG welded 1.00″ x .095″ wall 4130N chrome moly tubing and 1/4″ CNC laser cut and formed steel spindle mounting brackets that are fully gusseted to eliminate flex and provide for maximum strength and durability. They’re equipped with greaseable Delrin bushings for zero deflection rather than the soft rubber bushings that come from the factory. They are a 100% bolt-in installation using factory hardware. They’re available powder coated in your choice of bright red or gloss black for a brilliant and durable finish. Our chrome moly tubular rear trailing arms (track bars) for the Chrysler 300C and Dodge Charger, Challenger and Magnum will lock in your caster settings, minimize wheel hop and increase traction! Our chrome moly tubular rear trailing arms (track bars) are much stronger and lighter than the factory’s cast arms. They’re constructed from TIG welded 1.00″ x .095″ wall 4130N chrome moly tubing and 1/4″ CNC laser cut and formed steel spindle mounting brackets that are fully gusseted to eliminate flex and provide for maximum strength and durability. Our adjustable rear upper control arms for the 1979-2004 Ford Mustang and Fox Body cars outperform the flexible, stamped steel arms and soft rubber bushings that come from the factory. Eliminate wheel hop and increase traction with an easy bolt on installation. The adjustability feature allows for setting the pinion angle. Our right hand and left hand threaded CNC machined male/female double adjuster allows for easy on-car adjustments, no need to unmount the control arm to make adjustments!